Untitled (Farm in Stand of Eucalyptus, Carmel), 1920s? Few paintings by Randolph have surfaced, perhaps because for twenty-five years he devoted his energies to directing the California School of Fine Arts (currently the San Francisco Art Institute) rather than to creating paintings. Born in Ohio, he received extensive art training there, in New York, in Paris, and in Rome. In 1909 he first visited California, and in 1913 relocated there. Untitled (Farm in Stand of Eucalyptus, Carmel) is the best painting by him to yet surface. (Others, sold at auction over the last fifteen or so years, fail by being either European in subject, brown sauce in coloration or small in size.) Untitled’s bright colors and impasto and expressive brushwork make it post-Impressionist in style. 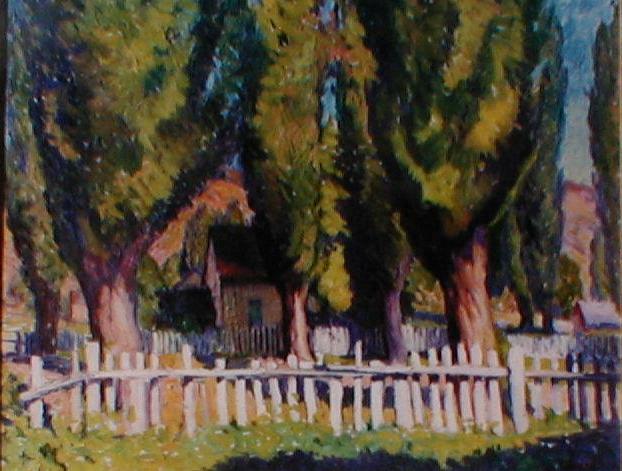 The farm may be an actual site in the Monterey/Carmel area as a similar subject was painted by other artists including Arthur Mathews. Randolph favored the Monterey Peninsula, settling there briefly after his arrival in California, probably visiting there while director of the CSFA (1917-c. 1942), and retiring there. Provenance: Rory White, dealer from Big Sur, c. 1995; Laguna Art Museum.